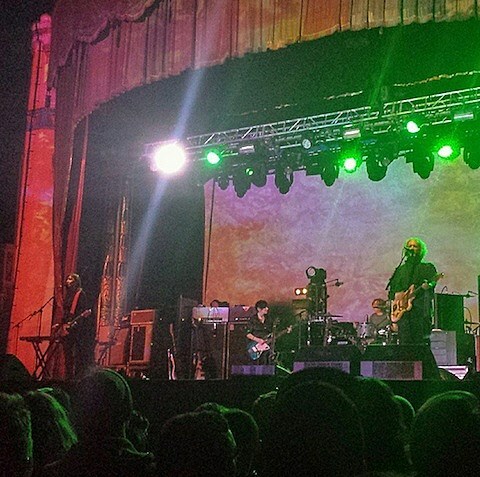 Shoegaze legends My Bloody Valentine returned to Chicago on Sunday night (11/3) for a performance at the Aragon Ballroom with support from locals Variety Lights. Interestingly enough, the show happened a day before the 22nd anniversary of their highly influential album Loveless. Walking into the venue, you could see ballroom employees handing out earplugs to concertgoers who may have come unprepared. (Not a soul turned them down.) Further inside a variety of merchandise was on display, including awesome new shirts featuring a young Belinda Butcher. The band’s years-in-the-making mbv and a poster were also for sale. Upstairs, Variety Lights were already well into their set and a sizable crowd began to gather. When My Bloody Valentine finally took the stage, fans lost it. Kevin Shields and co. kicked things off with a number of tracks from Loveless—like “Sometimes,” “I Only Said,” and “When You Sleep”—before mixing it up with some mbv material. Kevin orchestrated his abstract wall of sound with veteran precision while the rest of the band performed tightly at his side. Belinda, beautiful as ever, played her glittery red guitar and also shared lead vocal duties. A variety of psychedelic fever-dream patterns were projected behind them, making the perfect pairing with their music. The longer the band played, the louder they got. Well into their set I realized that the earplugs I had picked up beforehand were just about useless. Just when everyone thought things couldn’t get any louder, MBV then broke into “You Made Me Realize.” Roughly three-minutes in, they erupted into their encore: a cycle of airplane-like noise that lasted long enough to give those without earplugs tinnitus. (Imagine having your brain sucked into the engine of a 747 and spat out in the 4th dimension.) Just when it seemed like the crowd couldn’t take it anymore, the band finished their freak-out and switched back to the rest of the song. Amid the applause, I could still hear the encore ringing in the recesses of my brain. It’s time to invest in a nice pair of earplugs.